Have been sick for a few days, so all I have done has been to lie on the couch watching TV and had my dear computer for company. So cooking has been on hold because I could not eat anything . Take a look now around here on the page. Because I ‘ve updated a lot. Hope you will like what you read and I think you get a better glimpse of who Dinner Bank . My food philosophy is that less is more . Rather few ingredients and of good quality than to have a lot of padding that is neither good nor add anything . Let the food speak for yourself. Starr holding is always of the protein , ie, fish, meat, chicken , etc. Just got hold of the lovely white pepper from Malabar from OLiOLi shop . Fits quite amazing just to cod. A pepper with citrus tones and really practice magic on the food. Lovely, little strong long aftertaste. Not hot at all, by the tast you know it´s an uniqe white pepper. 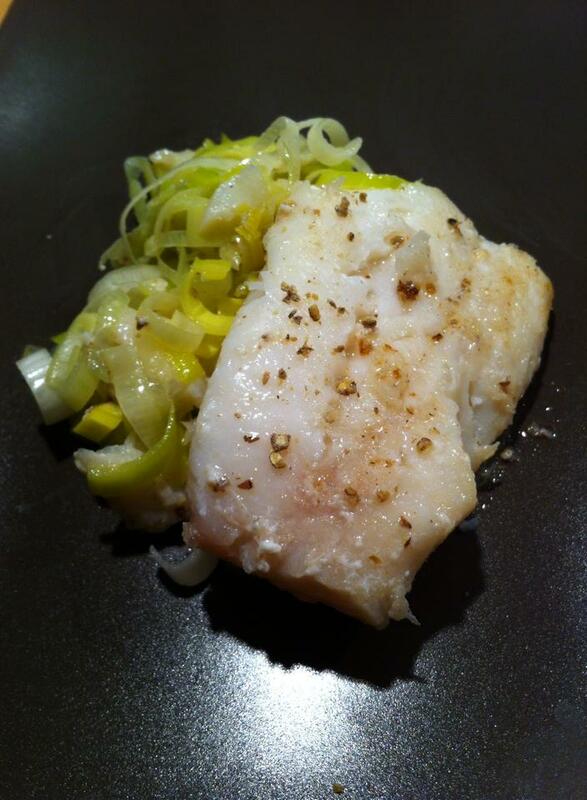 Start with salt and pepper cod. Allow it to stand for 1 hour so the fish will take the taste . Heat the butter in the frying pan. When just beginning to change color add the fish. Let it get fry for a few minutes , then flip the fish. Let it then becomes cooked through , but certainly not for long. Keep in mind that the fish will continue to cook when it comes out of the boiler by the heat contains. A fish cooked too long , it becomes dry and dull. Heat the butter and when it is golden brown add the leek . Let fry on medium heat until it becomes soft and transparent , without color. Just to add up , and serve with the cod. More than this is not needed to get a good tasty meal. Next Post Ready for an adventure?